The crossword in this week's Tablet gives a clue for 7 across: 'Grade of holy orders, now suspended in the Latin Church (6)'. I nearly whooped with delight: no, I've not gone nuts. It was the word 'suspended'. Usually people use the word 'abolished' and I have to patiently explain that the minor orders have not been abolished, but are simply no longer given except per saltem at the reception of the diaconate. The minor orders cannot be abolished, because they pertain to the very Sacrament of Holy Orders itself. The Council of Trent, Session 23, solemnly defines—in a canon with an anathema—that the Sacrament of Orders consists of both major and minor orders. If anyone says not, anathema sit. CANON II.--If any one saith, that, besides the priesthood, there are not in the Catholic Church other orders, both greater and minor, by which, as by certain steps, advance is made unto the priesthood; let him be anathema. It doesn't define the list in the canon, however; this is presumably because the East does it a little differently. For instance, if my memory serves me well, the subdiaconate is there considered a minor order. However, in the preamble to the list of canons, chapter 2, lists (without an anathema, however) that the grades of order are sevenfold, as follows: porter, lector, exorcist, acolyte, subdeacon, deacon and priest. Chapter II On the Seven Orders. And whereas the ministry of so holy a priesthood is a divine thing; to the end that it might be exercised in a more worthy manner, and with greater veneration, it was suitable that, in the most well-ordered settlement of the church, there should be several and diverse orders of ministers, to minister to the priesthood, by virtue of their office; orders so distributed as that those already marked with the clerical tonsure should ascend through the lesser to the greater orders. 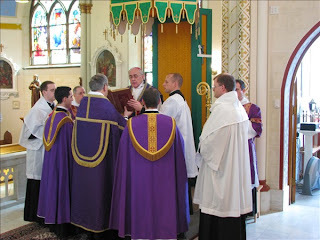 For the sacred Scriptures make open mention not only of priests, but also of deacons; and teach, in words the most weighty, what things are especially to be attended to in the Ordination thereof; and, from the very beginning of the church, the names of the following orders, and the ministrations proper to each one of them, are known to have been in use; to wit those of subdeacon, acolyte, exorcist, lector, and door-keeper; though these were not of equal rank: for the subdeaconship is classed amongst the greater orders by the Fathers and sacred Councils, wherein also we very often read of the other inferior orders. Notice anything? Yes, no mention of a bishop. Trent, then, did not consider Episcopate as a separate grade of order to priesthood. Rather, one may conclude, a priest is a bishop inhibited from exercising certain functions. 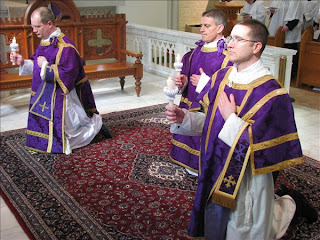 But a priest has these powers latently; the bishop exercises the fulness of the priesthood. If you view episcopacy as a separate grade of order, with separate powers, then this gets you into some problems. If a bishop is a successor of the apostles, but a priest is not, then how is it that a priest can exercise the unquestionably apostolic power of absolution? He needs the bishop's authority to do so, but this 'unlocks' a latent power already within him. A letter from a bishop cannot confer a specifically apostolic power on a man otherwise incapable. Likewise, at an ordination to the priesthood, each priest present, wearing the stole, lays hands on the head of the ordinand after a bishop has done so (and in the traditional rite of ordination, continued to extend his hand in consecration while the prayer of ordination was recited). And similarly, the priests co-consecrate the Chrism with the bishop. To take this traditional view of the Sacrament of Holy Orders also gets one around the fact that the earlier books of the New Testament seem to recognize only Episcopate and Diaconate; the Presbyterate appearing only by the time of the Pastoral Epistles. When I was in the seminary, quite a different approach to the Sacrament was taken. 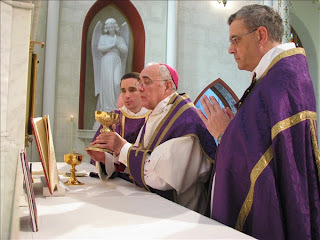 We were taught (by someone now a member of the hierarchy of England and Wales) that, following Vatican II, the Sacrament of Orders is to be considered as being threefold, consisting of Diaconate, Presbyterate and Episcopate. 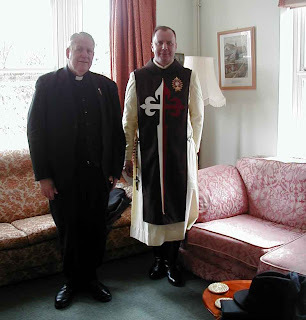 One passes from one order to the other; on ordination to the Presbyterate, the ordinatus ceases to be a deacon, and thus may never perform ('dress up and play' was the phrase used) as a deacon at Mass. I have been told (though have never checked it out) that this approach derives from the work of Karl Rahner; it appealed to the fathers of Vatican II, I suppose, because it appears at first sight to be more scriptural, since the only orders mentioned in Holy Writ, as above, are Diaconate, Presbyterate and Episcopate. For this reason, the Reformation communions that maintained a hierarchy of Holy Orders (such as the Church of England) only bestowed these three orders (according to their own understanding). So the adoption of a threefold system of Orders by the Catholic Church has the added advantage, to many, of being ecumenical too, in the West, while in the East, the Eastern Churches still maintain their own lists of major and minor orders. This is a bit of a mess, really, and needs sorting out authoritatively. But I'm delighted that the Tablet agrees with me. The minor orders have been suspended, but cannot be abolished, unless one wishes to be anathema. 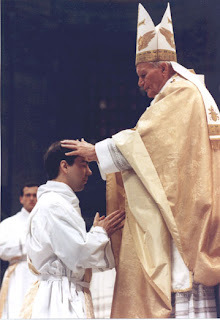 The priest being ordained in the photograph is our very own Fr Z. I hope he doesn't mind me using his pic; it was the first ordination pic that Google found, and it's a nice one. Zadok the Roman has alarming news that the Belgian government is considering legislating to extend euthanasia to teenagers who request it and to the elderly demented who are considered unable to choose for themselves. I haven't enjoyed the Sunday programme [a religious affairs magazine programme] on BBC Radio 4 for years. It has not, to me, seemed to observe any sort of an objective standpoint for many years—at least, as regards the things I regard as important. When it covers Catholic, or even conservative Protestant issues, when not actively critical, it adopts a sort of patronizing, condescending, 'ah, bless, we know better' tone that simply gets me cross. Today it addressed the issue of conscience concerning the debate on the Fertilization and Embryology bill. It was , it seemed to me, quite unashamedly one-sided: you can hear the debate yourself on the BBC website. While the Catholic opinion was, of course, addressed, as being one of the most clearly expressed of the Bill's opposition groups not one single Catholic voice was represented on the programme. It was entirely one-sided. The closest we came to an unbiased voice was, of all people, that of Lord Steel, the author of the original 1967 abortion act, who (unlike the others) accorded Catholics the right to have and even express an opinion, provided we did not seek to exert political pressure according to those opinions. The right to make one's opinion count is, I'm afraid, called democracy. Imagine if, a hundred and fifty years ago, those, yes, Christians, who opposed slavery accepted that they were welcome to hold their opinions, but must not exert political pressure. Imagine if the various feminist, or liberal, or secularist groups were to be dealt with as we have been. There would be howls of protest. The trouble is that the BBC, as other media groups, no longer see news as something to be represented dispassionately, but have taken a standpoint. This is bias. The BBC is not the Osservatore Romano, or even The Tablet. They cannot be expected to present our opinions as their own; however, I think we have a right to have our views expressed by ourselves and not by our opponents, with no opportunity of reply other than sending an email to the BBC website (as we were invited to do at the end of the programme). This loss of objectivity is deeply to be lamented. That day…the Independent ran a front page filled with a blue-tinted stock picture of a sharp glass tube piercing a cell wall. A headline read: 'Parkinsons; the breakthrough'. Beneath in parallel were two subheadings: 'Mice show significant neurological improvements' and 'Research will be hampered if Church succeeds in blocking Embryology Bill'. This is the new style of campaigning journalism of what was once called the quality press; news is not separated from opinion. We have another good pastoral letter from our bishop, Kieran Conry, this weekend. He speaks of some of the reasons why people should take the trouble to come to Mass, and, after stating some of the more usual reasons (obligation, obedience to our Lord), he lays additional stress on the importance of building up the Church by our celebration together of the Mass, by it (and other means) supporting one another, and passing on the faith to the next generation. The Church is, of course, the enduring presence of our Lord on earth—his (mystical) body, indeed, and in these days when many see Mass attendance as something to do when there is nothing better, it is good to get encouragement towards evangelizing even those in our own midst whose faith may be shaky or slowly developing. When I was a curate in Hove, many years ago, there was beginning a large influx of Egyptian and, I think, Sudanese, Coptic Christians. They had achieved some sort of critical mass which entitled them to be provided with a priest. I remember him well; Father Zakaria Botros was his name. He had been obliged to leave Egypt because he had been somewhat outspoken about the way the Coptic community were treated. At that time, All Saints Anglican parish church had afforded the Copts hospitality, and they offered Mass there regularly. After some time, they managed to acquire a redundant Anglican church, which became a church of their own. Fr Zakaria would attend clergy fraternal meetings, when we would share lunch. I cannot remember a single instance of him actually eating with us—it was always a fast day, he told us. And yet, every day cannot have been a fast day—his proportions were, let us say, generous. He would sit at the foot of the table watching us eat, and participating genially in the conversation. I remember the Vicar was particularly deferential to him, and he was certainly an imposing figure in his voluminous black cassock and hat, with a large pectoral cross that looked as if it were made out of black and white liquorice. I think the Vicar saw Fr Zakaria as a sort of natural ally—a 'catholic' (according to the Anglo-Catholic understanding of the term) who was not a 'Roman'. The Vicar got a shock one day, because when making some point or other to Zakaria about Roman hegemony and Anglican independence, Zakaria shook his finger under his host's nose and said 'this is very bad! You should return to your natural patriarch'. And eventually, he did. Fr Zakaria would often speak warmly of the agreement thrashed out between Rome and Alexandria concerning our Lord's nature. They basically believe what we do—they hotly deny that they are Nestorians [I should of course have said Monophysites here-see comments]—but are highly reluctant to accept the literal words of Chalcedon. Which is one hell of a problem to overcome. This is a very long introduction to what I really would like to draw your attention to. Fr Zakaria Botros, or perhaps another man of the same name (though the unflattering picture above, from an Islamic site, certainly looks like an older version of him) has, from his current home in the US, been making substantial waves in the Arabic world. He has taken his courage in his hands and begun to fight Islam back intellectually and publicly. For the first time a reasoned defence of Christianity is being made available to the general public in Islamic countries. There are plenty of good critiques of Islam written in English and other languages, but very little in Arabic. Fr Zakaria, very well read in the Q'ran and the Hadiths regularly goes on public television where he poses hard questions to the imams who visibly struggle to provide answers. The Arabic newspaper al-Insan al-Jadid calls him Public Enemy #1. I understand that his campaign of simply informing people of the odder and more rebarbative aspects of Islam has led to quite a number of converts. You can read all about it here—the article is quite long, and not very clearly laid out, but very much worth reading. At any rate, we must keep Fr Zakaria and his fellow-Copts very much in our prayers. Fr Zakaria has his own website in English here. 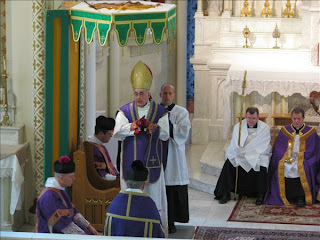 And you can read the transcript of one of Fr Zakaria's forthright broadcasts here. I have just returned from paying a call on two parishioners who are celebrating their 60th wedding anniversary today. What an inspiration these people are in these days of quickie divorces and casual relationships. May God give them more, and happy, years together. Yesterday evening I converted to the Christian Catholic religion, renouncing my previous Islamic faith. Thus, I finally saw the light, by divine grace -- the healthy fruit of a long, matured gestation, lived in suffering and joy, together with intimate reflection and conscious and manifest expression. I am especially grateful to his holiness Pope Benedict XVI, who imparted the sacraments of Christian initiation to me, baptism, confirmation and Eucharist, in the Basilica of St. Peter’s during the course of the solemn celebration of the Easter Vigil. And I took the simplest and most explicit Christian name: “Cristiano.” Since yesterday evening therefore my name is Magdi Cristiano Allam. For me it is the most beautiful day of [my] life. To acquire the gift of the Christian faith during the commemoration of Christ’s resurrection by the hand of the Holy Father is, for a believer, an incomparable and inestimable privilege. At almost 56 […], it is a historical, exceptional and unforgettable event, which marks a radical and definitive turn with respect to the past. The miracle of Christ’s resurrection reverberated through my soul, liberating it from the darkness in which the preaching of hatred and intolerance in the face of the “different,” uncritically condemned as “enemy,” were privileged over love and respect of “neighbour,” who is always, an in every case, “person”; thus, as my mind was freed from the obscurantism of an ideology that legitimates lies and deception, violent death that leads to murder and suicide, the blind submission to tyranny, I was able to adhere to the authentic religion of truth, of life and of freedom. I had to ask myself about the attitude of those who publicly declared fatwas, Islamic juridical verdicts, against me -- I who was a Muslim -- as an “enemy of Islam,” “hypocrite because he is a Coptic Christian who pretends to be a Muslim to do damage to Islam,” “liar and vilifier of Islam,” legitimating my death sentence in this way. I asked myself how it was possible that those who, like me, sincerely and boldly called for a “moderate Islam,” assuming the responsibility of exposing themselves in the first person in denouncing Islamic extremism and terrorism, ended up being sentenced to death in the name of Islam on the basis of the Quran. I was forced to see that, beyond the contingency of the phenomenon of Islamic extremism and terrorism that has appeared on a global level, the root of evil is inherent in an Islam that is physiologically violent and historically conflictive. 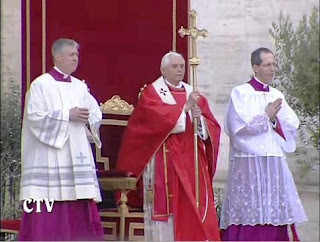 Today our Holy Father made his appearance wearing a Roman chasuble at the Solemn Liturgy of the Lord's Passion. Another step. The ceremony took place inside St Peter's Basilica, on account of the cold outside. I was intrigued to see that lace was much in evidence among the ceremonieri and the higher clergy: in our celebrations, we were careful to use plain linen (& polyester, I suppose) throughout. I also noticed that the Holy Father made the sign of the cross (discreetly) with the Host before receiving Communion. I suppose this means we may all do so, if his practice is the definition of the Roman liturgy. I also noted with pleasure the reappearance of the seven acolytes at the Maundy Thursday celebration. We've been pleased to have an afternoon of recollection this week, praying especially for the cause of Life—thinking about the Human Fertilization and Embryology Bill at present before parliament. This was led by Fr Jules and Br Anton of the Heralds of the Gospel, a flourishing new religious family. Fr Jules characterized their work in one pithy sentence 'our work is the New Evangelization'. That, I have to say, is music to my ears. Fr Jules, an Argentinian, is fluent in nearly all the major Western European languages, and sees an important part of his work as reconciling to the Church the many immigrants who have lost their way. They are very willing to come to parishes to conduct missions, retreats, talks &c, with a particular emphasis on devotion to our Lady—St Louis-Marie Grignon de Montfort is a particular favourite of theirs. Only recently have they been properly set up with their own priests; Fr Jules was one of the first to be ordained, about three years ago. The others, men, women, and even married people are the main driving force of the movement, wearing this rather striking habit that you can see Brother Anton wearing in the pic. Our Co-op has had a very smart refit. 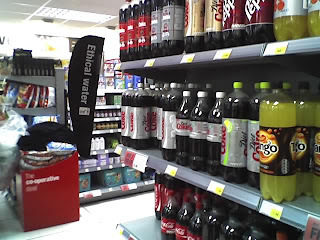 Among the new features is the redefinition of Coca-Cola as 'Ethical Water'. CONTINUING CONTROVERSY over the Pope's revision of the Good Friday prayer for the Jews in the old rite, which continues to appeal for their conversion to Christianity, may have masked for some another significant difference between old and new rite in one of the ceremonies taking place during Holy Week: the washing of the feet at the Maundy Thursday Mass. In the new rite the presiding priest washes the feet of 12 men and women from the congregation in a re-enactment of Christ's washing of his Apostles' feet. 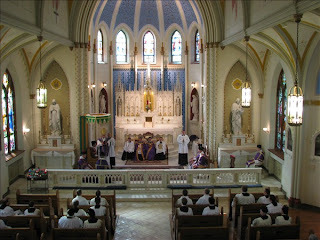 However, if the ceremony is used in the Tridentine Rite, only men's feet can be washed. Gordon Dimon, Master of Ceremonies for the Latin Mass Society, told us this week that it is against the rules for the priest to wash women's feet. "It would not be considered faithful to the rubrics. There would be no question of women's feet being washed. There is no sexism, it is a matter of decorum," he said. Er, I was under the impression that the new rite said exactly the same thing. Not (I observe ruefully) that it is always easy in every parish to practise what the law requires in this instance. 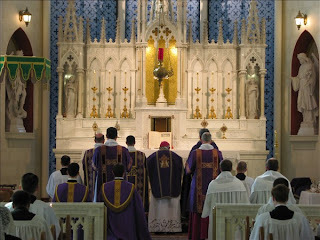 The Latin Mass Society have asked me to publish the following, which I am very pleased to do. It is a regret that I will not be able to attend, as we have our annual Blessed Sacrament procession that day. The Latin Mass Society is proud to announce that Cardinal Dario Castrillon Hoyos, President of the Ecclesia Dei Commission in Rome and Prefect Emeritus of the Congregation for the Clergy, has accepted its invitation to celebrate a Pontifical High Mass at the Throne in the Traditional Latin Rite (the Extraordinary Form) in Westminster Cathedral on Saturday 14 June at 2.00 pm. The LMS hopes to arrange for Cardinal Castrillon Hoyos to call on Cardinal Cormac Murphy-O’Connor, Archbishop of Westminster, at Archbishop’s House close to the Cathedral on Saturday morning. Cardinal Castrillon Hoyos will then deliver an address at the LMS’s AGM in Westminster Cathedral Hall later in the morning. 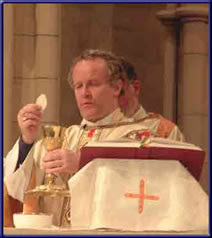 He will then take lunch with the LMS’s Committee members before celebrating Mass in the Cathedral beginning at 2.00 pm. Thanks to Fr Zee, I was entertained to find this clip, from which I extracted this pic. 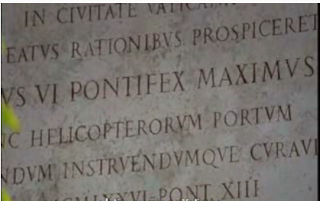 The clip features Fr Reggie Foster, the Vatican's idiosyncratic Latinist giving an interview in, er, Latin. The commentator is speaking in German. But don't worry; there are subtitles—in Portuguese. I hope my ears were not deceiving me this morning as I heard on the Today programme that the Education minister, Ed 'Balls' Balls, has accused, in Parliament, faith schools of not just accepting but demanding bribes from parents in order to obtain school places. His evidence was one sole email from one parent who had been asked by one unspecified grant-maintained (i.e. not necessarily faith) school for £37 per term towards school expenses. This seems to be a deliberate attempt once more to blacken faith schools. Not only are our schools hotbeds of bigotry and bastions of prestige, but now they are sordidly dishonest, too. The Conservative spokesman accused Balls of throwing up a smokescreen to deflect attention from the poor school placements made this year. I think the problem is deeper. n.b. There's a useful bit from Auricularius in the comment section —thanks. There is a very good book review in this week's Catholic Herald, written by Peter Mullen who is, I think, an Anglican. It concerns a new book by the philosopher Anthony Flew, engagingly titled: There is a God: How the World’s Most Notorious Atheist Changed His Mind. And it does just what it says on the tin. Flew for all his life was, well, the thinking man's Richard Dawkins. He was a pungent proponent of atheism, and the announcement of his 'conversion' was greeted with huge intakes of breath from various quarters. I put the word conversion into inverted commas because he is not converted to Catholicism or even Christianity, merely to Theism. But the conversion seems very sincere, and his arguments have a particular force, coming from one who so profoundly held their contrary so recently. I shall be sure to get this book, maybe some time soon. The arguments as summarized by Peter Mullen have whetted my appetite. Did the universe come into being by chance? Flew examines the famous monkeys and typewriters argument, by which it is argued that, given an infinite supply of monkeys and an infinite supply of typewriters, they would together eventually produce the works of Shakespeare. Flew does the maths and demonstrates that "...if you took the entire universe and converted it to computer chips - forget the monkeys - if you turn the entire universe into these microcomputer chips and these chips were spinning a million times a second producing random letters, the number of trials you would get since the beginning of time would be 10 to the 90th trials. You will never get even a single sonnet by chance - let alone the complete works. The universe would have to be 10 to the 600th times larger. Yet the atheists think the monkeys can do it every time." You can read the review here, on the Catholic Herald's splendid new website. And now we need to pray for Richard Dawkins. Am I alone in detecting a desperation in his arguments? Does he not find them particularly convincing himself? I am proud to have a couple of friends who are priests of the Romanian Catholic Church, following the Byzantine liturgy. In their case, this also includes the Julian Calendar (as reformed by Julius Caesar), as opposed to our Gregorian Calendar. This means that, whereas we are celebrating Easter this coming Sunday, Fr Augustin kindly sent me Easter greetings just as he and his congregation have only begun Lent! For them, Easter will be on 27th April. I hope I remember to send him Paschal greetings, just as we are about to celebrate Ascension. I've discovered a very encouraging new game. You start with a picture, such as that on the left, from this morning's Palm Sunday Mass, and you count how many things you approve of, lift your spirit, and make you think that everything might be all right after all. 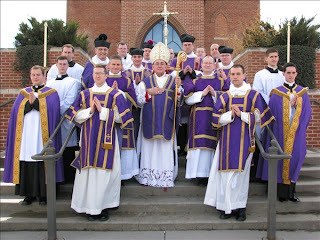 At least three, I think: dalmatic, much nicer cross and lace cotta. Now when the cross grows two more bars (or disappears altogether), I'll break out the champagne. Now don't make the mistake of thinking that I'd go to the stake for any of these things, but it is so nice to see a care for doing things properly. I thought it was a fairly universal custom that the Solemn Afternoon Liturgy on Good Friday was kept at 3pm. But I see that in St Peter's (that's not St Peter's Shoreham, but the other, less well-known St Peter's in Rome) the Holy Father is to celebrate at 5pm. And the Vigil in the Vatican is not arranged to coincide with Midnight Mass, as in the past, but starts early, as most of us do for good pastoral reasons. In fact, since the Holy Father is starting at 9, and here in the Adur Valley we are starting at 8 (it will be plenty dark by then), we will be celebrating at the same time as the Holy Father. Strangest of all, really, is that the Holy Father's Maundy Thursday Mass of the Lord's Supper really seems to be a Mass of the Lord's High Tea, since it is due to start at 5.30pm. I also notice that the Chrism Mass is to take place at the Vatican, and not at the Lateran. Does anyone know if this is an ancient custom? Today we should be celebrating the feast of St Joseph, but the diocese have messed up the Ordo (again), leaving priests with a dilemma. Do we celebrate with the Universal Church or with the Church of Arundel and Brighton? My instinct would have been to go with the former, except that the mistake in the Ordo was not discovered in this parish until it was too late to inform people of the feast. So, the Adur Valley will have to keep St Joseph on 31st March and the Annunciation on 1st April. Please excuse the lack of posts recently: it's that time of year again! It is a particular pleasure to post some photographs here of the Diaconal ordination of a friend of mine, the Reverend Matthew Goddard, the son of another friend of mine, Father David Goddard, the priest-in-charge of my next-door parish, West Grinstead with Henfield, through which the bounteous River Adur also flows her happy way. No, you haven't misread: Fr David and his family all became Catholics in the 1990s, and by happy provision of Pope John Paul, Fr David, who had been an Anglican clergyman heretofore, was ordained a Catholic priest and now lives with his wife and daughter Kate, as Guardian of the Shrine of our Lady of Consolation, West Grinstead and Priest-in-charge of Henfield. His son, Matthew, is now (as you can see) a deacon in the Fraternity of St Peter: he was ordained a few days ago in the States, and kindly agreed that the pictures of the ceremony might be posted here. 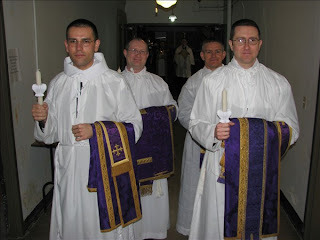 They are a little out of order—partly this is because they arrived that way, partly because I have never been to a traditional-rite ordination when only deacons were ordained—though I have been to some where only priests were ordained, and where all three major orders were conferred. If I remember rightly, in that context, diaconate ordination came before the Gospel. So excuse my mistakes if I have got the order wrong. Here, we see the bishop being vested. Having once or twice assisted in this role, I think this takes a particular kind of patience on the part of bishops. It's a bit like going to the barbers, but having seven barbers all taking a turn. Here are the ordinands; Subdeacon Matthew is left, back. And here the sacred ministers. This is Bishop Corrada, of Tyler in Texas, a Jesuit, would you believe? I'm told he is A Good Thing. And here the interior of the church: it looks like the presentation of the candidates. This seems to be the collect. 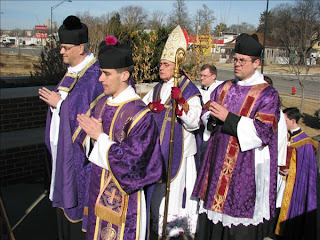 The assistant priest is Fr Bisig, the first superior-general of the FSSP, who is now in the USA. When I first met him, his English wasn't great, so it is a real achievement for him to be now working there. I remember well the welcome he and his colleagues gave me when I visited Wigratzbad shortly after its establishment. 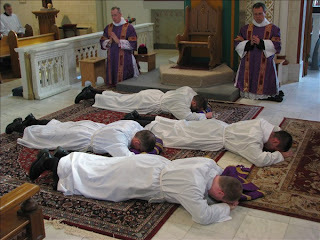 The prostration during the Litany of Saints. The laying-on of hands; this, with prayer, constitutes the matter and form of the Sacrament of Orders. Having had both (ungloved) hands laid on me at my diaconate ordination, I remember my surprise at the sight of one gloved hand when I saw the Traditional rite for the first time. Now the 'tradition of instruments'. The mediævals considered this the moment of ordination. The book of the Gospels is handed to the new deacon. The offertory of the chalice. In the traditional order of Mass, the deacon offers it with the priest (in this case, the bishop) and says the prayer of offering with him. The bishop blesses all the clergy at the end of Mass. 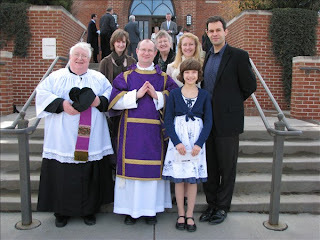 And finally, the happy Goddard family: Fr David, clearly, is on the left. God bless them all: they are all wonderful people. Thanks to Alexander Colley for sending me this. As I write this, the funeral is taking place of Dom Gérard Calvet, the founder and first Abbot of the monastery of Le Barroux, near Carpentras in southern France. I first visited Le Barroux about fifteen years ago: I was on holiday with a friend in Nice, and we took it into our heads to pay a visit. From the very start, I loved it. Since I was a seminarian, I had been making my retreats at French monasteries with a more traditional stamp—Fontgombault for the most part which, at the time of my first visit, was still using the Novus Ordo. The liturgy and the chant were really wonderful at Fongombault, especially after they began using the traditional rites. The aristocratic severity and hauteur, though, was something that I didn't warm to. I have since been told that this can be rather typical of many houses in the Solesmes Congregation. After this experience, Le Barroux was a revelation. In one sense far more hard line than Fontgombault, there was nonetheless a human warmth which was all the more welcome for the fact that it was unforced; patently genuine. In all my subsequent visits, I have never failed to find their unfailing good humour and friendliness utterly disarming. 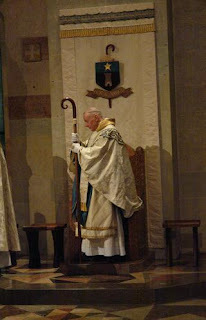 I know of two priests who went to Le Barroux much as one might go to see a horror film, to see how dreadful things were before the Council, but who were completely won over by the friendliness of the monks and the beauty of the liturgy, celebrating thereafter the traditional Mass themselves. In the interests of fairness, I should add that I have visited Fontgombault more recently and found the temperature to be much warmer than heretofore. There can be little doubt that the spirit of Le Barroux is largely down to its founder, Gérard Calvet. He was born in Bordeaux in November 1927, entering the Benedictines at Tournay in 1950, where he was ordained priest in 1956, and, one assumes, planned to lay his bones there and spend his life very much as he had begun it. Such was not to be the case, of course. The ecclesiastical turmoils of the 1960s did not leave his abbey untouched, and so, with the leave of the Abbot, he got on a motorcycle and, with his entire belongings on the carrier, determined that, as he could not live a monastic life in the monastery, he had better try outside it. After a year as a hermit, he found an old church at Bedoin in the Vaucluse, dedicated to St Mary Magdalene, and he arrived on his motorbike 24th August 1970 to make what he called 'the experiment of tradition'. His first postulant arrived a few days later: Dom Gérard protested that he could not possibly accept novices, but the young man insisted, and definitively moved in that November. Within a year they were eleven, and had set about restoring the ancient priory attached to the church. The whole life of tradition was vitally important for the community, and so it was to Archbishop Marcel Lefebvre that Dom Gérard turned when in July 1974 some of his community were ready for ordination. This put the Abbot of Tournay in a difficult position, and he decided to shut down the community at Bedoin. Dom Gérard went to Rome to appeal, unsuccessfully, but he felt that the work was simply too important to stop, and so the decision was made to continue, with or without Tournay's approval. The community continued to grow apace, with members living as best they could in caravans and builder's huts, and so, in 1977, the decision was made to build a new monastery. It would cost a great deal, and so Dom Gérard appealed up and down France until he had the funds for the work to proceed at Le Barroux where, in 1980, the first stone was laid. The crypt of the church was the first part to be built, and the guest quarters, and so it was to here that the monks moved in, without heating or electricity, in December 1981. Archbishop Lefebvre consecrated the altar in the crypt, which was then used for the monastic services until the building of the main church above, which began in 1986 and took three years. Dom Gérard had always enjoyed a good relationship with Archbishop Lefebvre, but found him rather too immobile and unbending, a 'suspicious man', he called him. In particular, he believed that the episcopal consecrations of 1988 were a profound mistake and would lead, ultimately to schism. He believed that Lefebvre should have accepted the accords proposed by the Holy See, and so he himself responded positively to Rome's offer in June 1988 that his monastery be able to function under the terms of the accords. Rome then raised Le Barroux to the status of an Abbey with Dom Gérard as its abbot. Among the supporters of Archbishop Lefebvre this was seen as rank treason. Many of these folk had given very generously to the building of the monastery, and felt that Barroux should have held firm. Their daughter congregation in Latin America parted ways with them and remained allied to the Society of St Pius X. But Barroux continued to flourish, and, despite baleful predictions, continued to maintain the full traditional liturgy. Another problem arose when Dom Gérard, visiting Rome, was asked by Pope John Paul to concelebrate Mass—in the Novus Ordo—with him. Dom Gérard agreed to do so, and for this was vilified by many traditionalists: 'He says the new Mass!' it was alleged, in shocked voices. Dom Gérard simply threw up his hands and said 'One does not refuse the Holy Father, after all'. Dom Gérard was no prissy sanctuary-obsessive. One year he and some fellow monks spent Christmas in prison for invading an abortuary and chaining themselves to the surgical equipment. The whole enterprise of building a monastery and holding firm in the face of considerable opposition against tradition reveals the man with the loving smile to have had a backbone of steel. His health was not to last, however; a stroke partly paralyzed him, though for a while he continued to run the abbey, habitually celebrating the main Sunday Mass and preaching at it, too. I remember him well, surrounded with the various ministers for a Pontifical Mass, gamely wielding his crutch and showing as much energy as he ever had. But in the end, it became too much, and, having made another foundation in France, near Agen, he resigned the abbacy in 2003, being 75 years of age, and was succeeded by Dom Louis-Marie, the present abbot. Last week, returning from a family funeral, Dom Gérard had another stroke and gave his soul to God. May he rest in peace, and may his foundation flourish. Recently an agnostic, faced with our foundering civilisation in thrall to liberalism ("to every man his own religion", and so "to every man his own morality":- you see just how far that can go!) and to materialism ( a two-dimensional universe without after-life or a beyond) remarked: "You monks, you are the most useful members of society." We retorted: "How can you say that if you believe neither in God, prayer nor heaven?" He replied; "Because we are witnessing a haemorrhage of values, a continuing evolution where everything is questioned, a real collective suicide. Now amidst the general rout you monks are witnesses to the permanence of values. And make no mistake, the day you cease to be uncompromising you will interest us no longer." An interview with Dom Gerard, telling of his break with the Pius X Society here.